It’s a different world than the one we grew up in. Do you worry about the culture your children are growing up in? You’re not alone. We do too. Across the nation, we’re facing deadly heroin and suicide epidemics. We’re seeing increases in addiction, violence, adolescent anxiety, and according to one U.S. Attorney, “today’s parents have a zero margin for error” when it comes to protecting their children from today’s drugs. Our children, saturated by technology and social media, have more “voices” than ever vying for their attention. With all the stuff out there that our kids are being exposed to, can we still raise healthy, well adjusted, drug-free teens and preteens? As parents, we must choose awareness and prevention. Wouldn’t you rather be equipped to recognize the early warning signs of things like anxiety, bullying and dating violence before they turn into something more harmful, like cutting or even suicide? These are just a few of the topics we address in our Parent Handbooks. 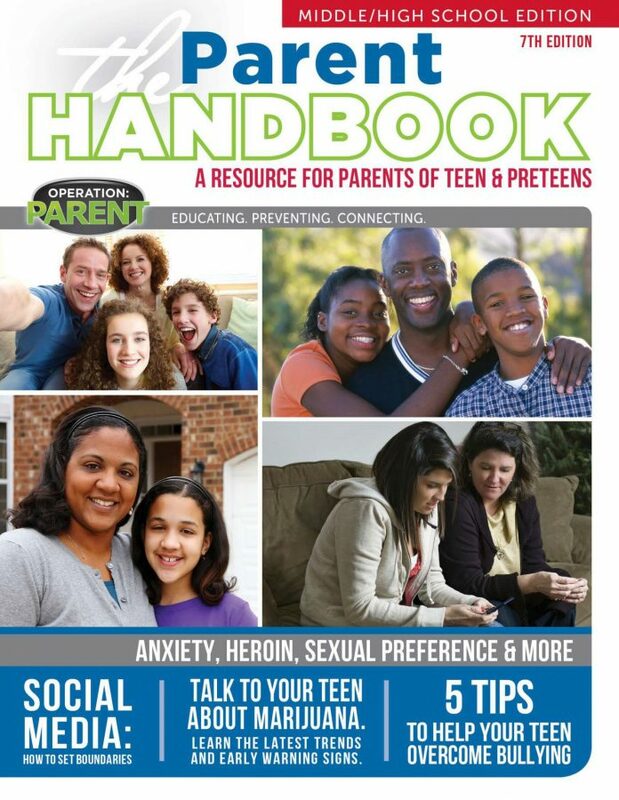 Our resources, help educate parents so they can “connect-the-dots” between seemingly harmless issues, like social media use to high risk behaviors like, substance use. Every day, parents like you are working hard to protect their children. It’s all about awareness and prevention. If we miss early warning signs and find ourselves beyond prevention, then it’s about getting professional help (often for the entire family) and being persistent. Your family is worth the fight. Equip yourself with the life-saving information we provide in our Handbooks where you can also find trends, warning signs, misconceptions, tips and advice for the toughest issues you may face during your parenting journey. Your family matters to us. Why? Because we are parents too. We know what it’s like to walk the everyday tightrope of “what’s the right thing to do?” We are the number one influence in our children’s lives so, it’s up to us to be and stay informed. While, clinicians, counselors and experts can help ultimately no one knows or loves our children more than we do. We are called to protect and must therefore step boldly into our God-given role as parents. It is our values, our real-world experience, and our courage that will ultimately make the difference in the lives of our children and grandchildren. So, let’s do this. Join our community of empowered parents by following us on social media or joining us for an upcoming webinar. But, most importantly… keep parenting!